This is not to say this is a bad thing. Often problems can be diagnosed and prevented immediately. However, the grower diagnosis is often incorrect or diagnosed through an internet image search. In greenhouse production, especially in propagation, an incorrect diagnosis can be costly. I was recently sent an image of a dying sedum (Figure 1). The grower asked if this was bacterial, specifically Erwinia soft rot. The cuttings had collapsed and were “melting”. These symptoms do resemble those seen with some bacterial pathogens. However, I thought the problem might be caused by the oomycete pathogen, Pythium. Depending upon the causal agent, two very different management practices and chemical options are needed. 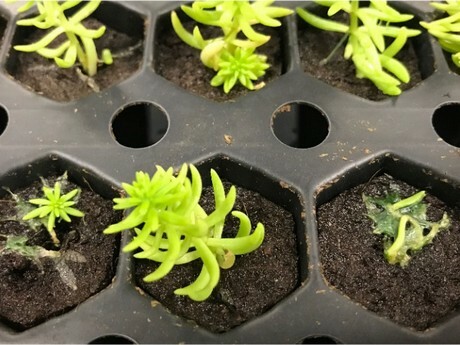 Figure 1: Image of collapsing Sedum in propagation sent by grower via text message for diagnosis. Luckily, the grower was able to send a physical sample (Figure 2). The correct diagnosis was Pythium. Round sporangia and oospores were found in abundance within the collapsed leaf tissue (Figure 3). 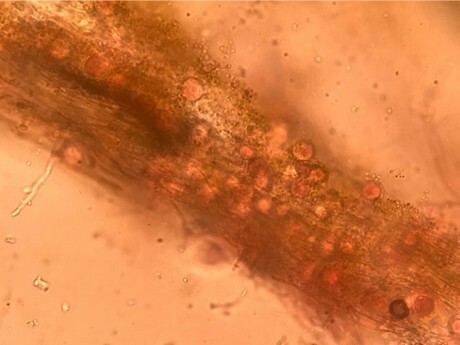 Pythium is most often thought of as a root pathogen that causes softened, honey- colored roots, and the characteristic sloughing of the root cortex. Pythium can also infect stems, fruits, and foliage causing a soft rot. Cucumber growers might know of the disease “cottony leak”, which produces white cottony hyphae and disintegration of the fruit. I was fooled a few months ago when sent images of wilting poinsettias that had white hyphae growing along the stems (Figure 4). I thought this might be Phytophthora; however, a physical sample confirmed Pythium infection. Figure 2: Physical sample brought to the UGA Plant Disease Clinic for diagnosis showing collapsed plants and some with yellowing lower leaves. Pythium in propagation presents many problems. Pythium infection thrives in moist, saturated conditions with high humidity. These are the exact conditions found in most propagation areas. Cutting back on water to reduce saturation isn’t really an option when plants don’t have roots and they are being misted repeatedly throughout the day. Fungicide use and choice can also be an issue. Applications by drenching wets the rooting medium, but it can be washed out of the small cells with repeated wetting. If there are little to no roots in the medium, the fungicide may not be absorbed into the tissues. Protecting young foliage and the lower stem is the goal. Fungicides containing etridiazole, trisaluminum (fosetyl-Al), and mefenoxam are very good at reducing Pythium infection. Other fungicides labeled for Pythium control containing azoxystrobin, cyazofamid, fenamidone, fluopicolide, propamocarb, and pyraclostrobin (listed alphabetically) range from poor to good in efficacy. See the fungicide efficacy table (https://bugwoodcloud.org/bugwoodwiki/Orn_efficacy_table2017.pdf) for more information. Figure 3: The stuff of nightmares. An abundance of round sporangia and oospores of Pythium (stained pink) infecting the soft, collapsed leaves of the submitted Sedum sample. Some of the issues of concern with fungicide use for Pythium is that fungicide resistance is known, especially to mefenoxam. Personally, I still recommend mefenoxam early in propagation because it is systemic and can protect the young foliar tissues and, in my efficacy trials, resulted in greater root growth compared to other products. When using fungicides, rotate products with different FRAC numerical groups to reduce fungicide resistance development. In addition, most Pythium fungicides are labeled for repeat applications at 4 to 12 week intervals. This is too long of an interval for a rapidly growing plant with expanding roots and foliage. 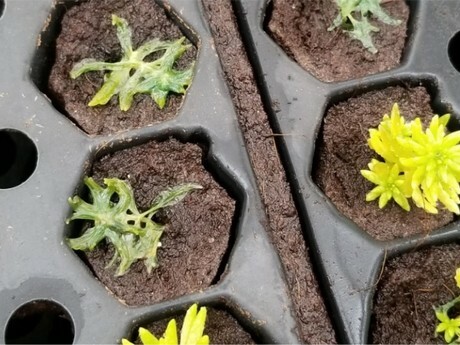 Therefore, after the initial application of a systemic fungicide to protect recently stuck cuttings, rotate to another product with a different mode of action (different FRAC numerical code) after 10-14 days to continue protecting new growth as it develops. As always, follow all label directions when applying any pesticide. Remember if your crop is not listed on the fungicide label, test it for possible phytotoxicity. Of the fungicides mentioned, only mefenoxam (Subdue Maxx) lists Sedum on its label. Another option is to incorporate biological control products into the rooting medium or drench with them immediately after seeding or sticking to reduce Pythium infection very early into propagation. These can be very effective preventive treatments. 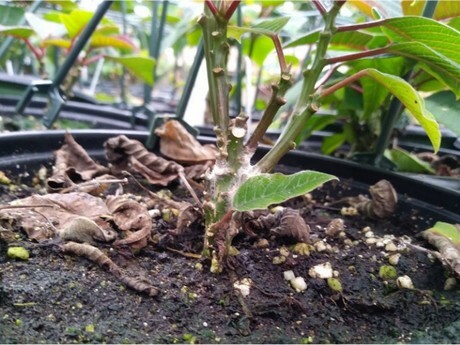 Figure 4: Image of a wilting poinsettia with white hyphae of Pythium growing along the stem. Plants are very wet with algae growth on the rooting medium. Management of any plant disease requires a multi-pronged approach. It all begins with sanitation to reduce introducing pathogens in production, especially in propagation area. Once disease symptoms are seen, remove those flats or plants to reduce pathogen spread. Then, modify the growing environment, if possible, including reducing plant wetness, humidity, and poor air circulation that are likely to contribute to disease development and spread. Finally, use appropriate fungicides or biological products to reduce pathogen sporulation and growth. Remember that fungicides are best used preventively and will not cure infected plants. Most importantly, proper diagnosis of the problem is essential. Many plant disease diagnostic clinics and county extension personnel accept digital images of the samples. This can give a rapid response to the problem and/or direct growers on where or how to look at the crop for additional symptoms or signs needed for a more accurate diagnosis. In the case of the poinsettia sample mentioned previously, my misidentification of the pathogen from the image (Phytophthora rather than Pythium) wasn’t really a problem since the management options are essentially the same for these pathogens. However, this is not always the case. Mistakes in identifying the problem can result in costly mistakes. 2019-04-19 Where do thrips come from? 2019-04-17 "Less water, better results"
2019-04-08 "Keep an eye on substrate pH for iron inefficient crop species"
2019-04-04 "This product is a great tool in the fight against botrytis"